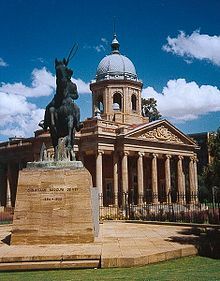 ^ "Bloemfontein | national judicial capital, South Africa". Encyclopedia Britannica. Retrieved 2018-12-19. 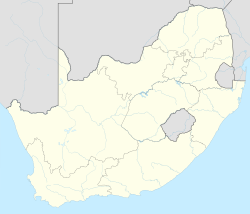 ^ "History of Bloemfontein, Free State, South Africa". 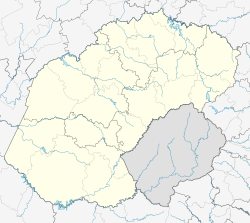 Bloemfontein Guide. Retrieved 2017-01-20. ^ tinashe (2011-11-08). "The Union of South Africa 1910". South African History Online. Retrieved 2017-12-16. ^ sahoboss (2011-03-20). "African National Congress (ANC)". South African History Online. Retrieved 2017-12-16. ^ sahoboss (2011-03-30). "National Party (NP)". South African History Online. Retrieved 2017-12-16. 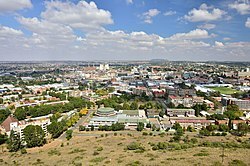 ^ a b "Bloemfontein the Segregated city". SA History Online. 2011-03-30. ^ "Toyota Cheetahs". Guinness PRO14. 2017-08-29. Retrieved 2017-09-14. ^ "IMSSU - World Championship Results". www.imssu.org. Retrieved 2019-03-14. ^ "IMSSU World Championships 2016". www.imssu.org. Retrieved 2019-03-14. ^ Monster Family Fun Competition 1 March 2018 (2018-03-01). "Go Green Expo – Bloemskou | 26 April – 05 May 2018". Bloemskou.co.za. Retrieved 2018-06-07.